"Marinated steak strips and flavorful veggies make a delicious fajita filling--perfect for busy weeknight dinners." Preheat oven to 400 degrees F. Drain meat; discard marinade. Center meat on a sheet (12x18 inches) of Reynolds Wrap(R) Heavy Duty Aluminum Foil. Bring up foil sides. Double fold top and ends to seal packet, leaving room for heat circulation inside. Center sweet peppers, onion, and garlic on another sheet (12x18 inches) of heavy duty aluminum foil. Repeat steps above to make another foil packet. Bake meat and vegetable foil packets 30 to 35 minutes or until meat is desired doneness (145 degrees F for medium rare) and vegetables are tender, adding tortillas to the oven for the last 10 minutes of baking or until heated through. 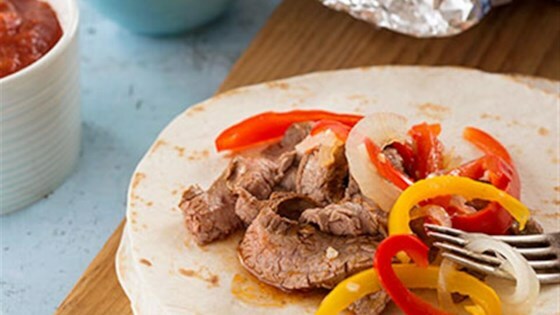 These flavorful fajitas are perfect for a quick and easy weeknight meal! Simply make ahead and cook when you get home. Then, to add the perfect finishing touch for any fajitas or soft taco meals, just wrap and heat the tortillas in foil. It's a fast way to get that restaurant-style tortilla taste and texture at home! These very delicious. Very easy to make and clean up a breeze. Easy to prepare and easy to clean up! What I love about this recipe is the marinade. I marinated the flank steak for 45 minutes, and the meat was so flavorful! A great choice for Mexican night!